It’s an emotional, cup-full-of-tears, watery-cat sort of month, kitties! The suit of Cups in the tarot deck represents our emotional world: our feelings and all things heart-related. 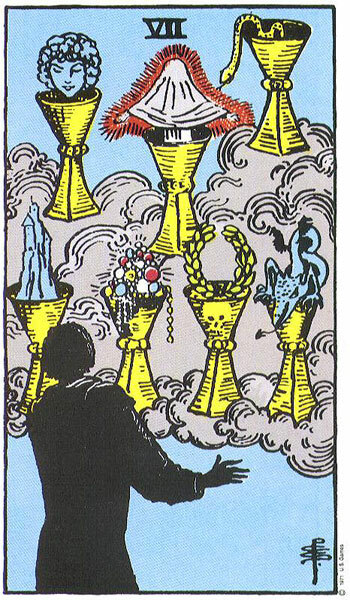 The Seven of Cups is an exciting looking card. The figure is clearly surprised by what he’s seeing, as though the cups popped up in front of him out of nowhere. Generally this card applies to situations where there’s too much going on and you see seven different paths of possibility ahead of you instead of just one. Allowing our emotions to guide our decision making can be problematic, particularly when we have so many options. If someone were to hand you a cup full of candy, for example, you might just gobble it all up, because at first glance it’s such a pleasant surprise. But consider that you may have already eaten that day, or you were planning on going for dessert with a friend or lover later and now you’ve overeaten, ruined your appetite, and have indigestion. There’s a thin line between illusion, disillusion, reality and expectation. Generally speaking, when you see a card like this, you’ll feel in your gut whether the situation is teeming with the energy presented in the card, and you need to start moving in a way that’s less like the archetype; or, if you need to infuse your situation with a little more of its energy. If your situation feels rigid and you only have one way to go, maybe open yourself up to the possibilities of there being a few more options. Conversely, if you feel like you have too many possibilities, it’s time to stop thinking about them in such an emotional way, and really consider the pros and cons of each direction in order to best make a decision. Knowing that things that appear amazing at the outset, like a cup full of candy, could instead have negative consequences down the line, we should take care to infuse a second guessing, rational form of thinking to our decision making this month. Conversely, the things that appear negative at first glance - say, a cup you take out of the cupboard, only to discover it’s hiding an overdue bill in it - could end up leading to something really positive down the line (such as making an important connection with someone at the bank who agrees to fund your passion project or business idea). As with all of our monthly readings, we pull a second card to help you assess the situation and then decide how to best move forward. This month the Three of Cups is your qualfiier. It’s a joyful card depicting three beautiful women rejoicing together with their cups. This card represents sisterhood, connection, yin/female energy. Women are often the glue that holds together communities and the social sphere of our lives. Consider the energy of genuine loving, sisterly, womanly power and deep understanding that comes with the connection of these three women and their cups. 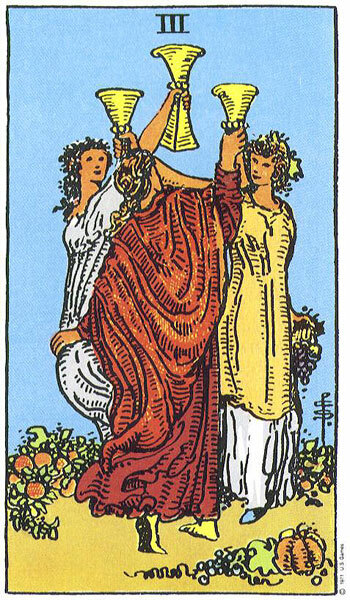 Of course, this being a “group” card - one of three in the deck - it does not have to represent a group of women, or even be female-oriented, but the energy of the card should be seen as a softer, less active sort of group energy. Turn to your group of kitties this month to connect and share and feel out your situation within the larger scope of the group. Even if you don’t know what decision to make, or you feel stuck with a decision you’ve taken, opening yourself up on a day-to-day level - having a night in with friends, going on a retreat, spending the weekend away, organizing a wine and cheese night - and bouncing ideas off your friends in a safe space will help you take better action in the future. It’s always good to get outside of yourself in general!